What would happen if a bishop acts against the basic tenets of Christianity, the Bible and the constitutional norms? 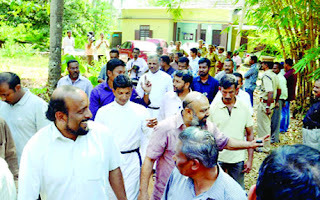 The North Kerala Diocese – Laity, Clergy, the elected officers and the Executive Committee - finds itself in an unenviable position, as an onlooker, to the truant behavior of a bishop who has lost all sense of proportion in defending his undemocratic, corrupt and unjust actions. The latest episode is related to the bishop’s US-Canada visit purported to be at the behest of the Ecumenical Fellowship to participate in their Christmas Programs. Our friends in the US can enlighten us on this Ecumenical Fellowship which had not found anyone else other than Bishop Kuruvilla to be their chief guest. 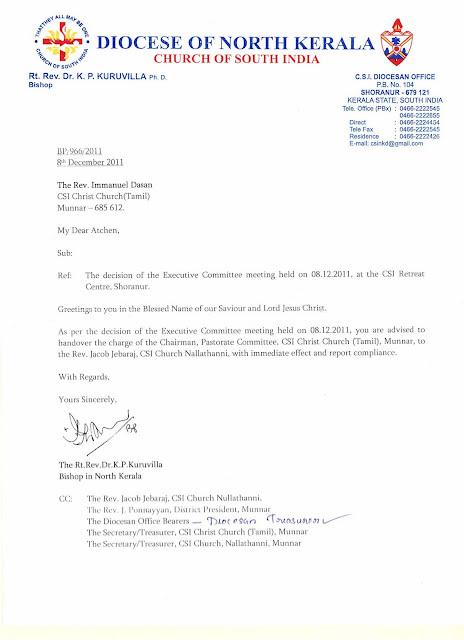 We know that this Ecumenical Fellowship is as non-existent as the ‘CSI meeting’ that the Bishop had referred to in the Thalikulam sale deed, as authorizing him to sell the property. If he can enter into such a clandestine and unauthorized land deal, nothing prevents him from touting such blatant lies. 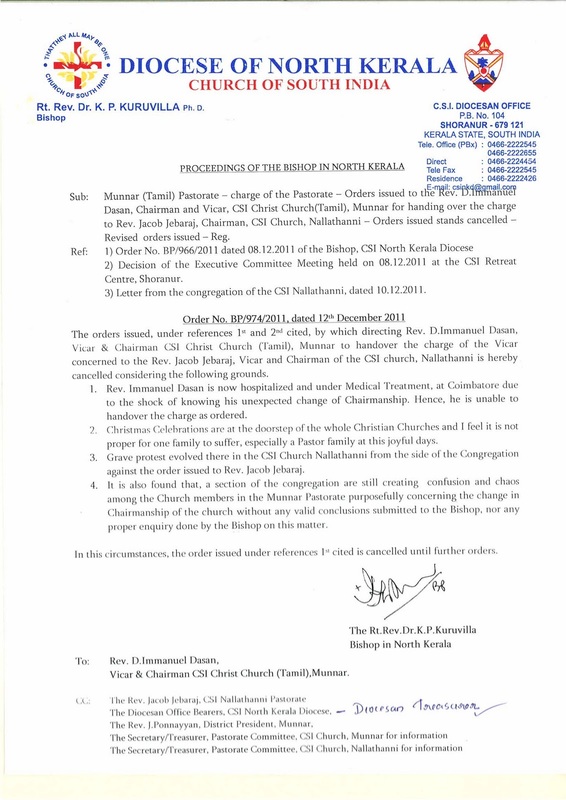 The CSI North Kerala Diocese would be grateful to our fellow believers in the US if they could find a way to rehabilitate this bishop who has lost his moral right to shepherd a diocese. This gathering gave a signal to the bishop that they might not just let him embark on his overseas trip. As can be expected from the devious mind of the bishop, the immediate response was to call the police. But the police backed off realizing that this is a standoff between the bishop and the officers and that they have a legitimate ground to hold the bishop accountable. This standoff continued till 1 pm on 14 December. On 14 December, to the disgrace of the august office of bishop and Christian witness, the police officers had to bring the bishop to the negotiating table and play the role of a mediator. The police officers had to preach to the bishop of the virtue of love and forgiveness and concern for the employees under his care especially at a time as Christmas. Finally, he signed the cheques necessary for the day to day administration of the diocese. He also compromised on his stand to let go of the hook another fraud and criminal henchman, the Presbyter of the CSI Christ Church (Tamil), Munnar, Rev. Immanuel Dasan and agreed to sign a show cause notice to Rev. Dasan for his glaring misappropriation of funds. The way the bishop went out of the way to delay and detract the decision of the Executive Committee to remove Rev. Dasan from the chairmanship of the Christ Church, Munnar, illustrates the bishop’s complicity in many of the scams associated with the properties in Munnar. The sequence of events on the actions taken against Rev. 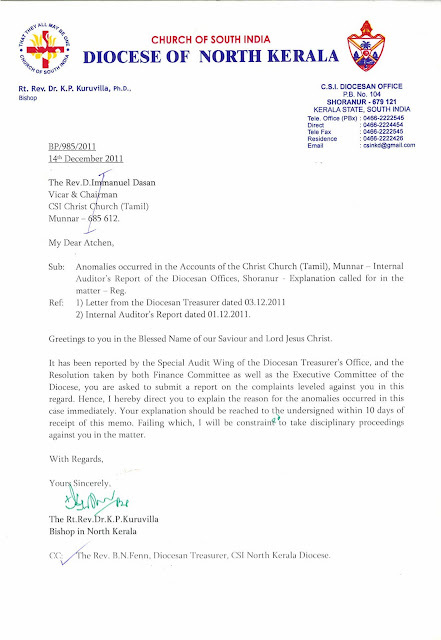 Dasan is as follows: The Special Audit Wing of the Diocesan Treasurer’s office visited Christ Church, Munnar and found grave irregularities in the accounts. As per their report, the Finance Committee and the Executive Committee, the meetings chaired by the bishop, resolved to divest Rev. Dasan of the chairmanship of the pastorate and hand it over to Rev. Jacob Jabaraj. Then the bishop sent a letter conveying the decision of the Executive Committee and asking Rev. Dasan to hand over the charge to Rev. Jabaraj (below this post, see bishop’s letter of December 8, 2011). He did this to satisfy the diocesan officers. On the same day, by a letter not dated, he cancelled his own order sent to Rev. Dasan sighting flimsy reasons, probably at the instigation of Jacob Mathew, who was the main go between in the fraudulent property transactions in Munnar (below the post, see the letter). The Bishop thought that he could abscond after denigrating and defrauding the officers, the Executive Committee, the Finance Committee and the people in the pew in general. But they forced him to issue a show cause notice to Rev. Dasan. But we can now anticipate the scheme of the bishop – Jacob Mathew - Dasan trio. Rev. Dasan will be given time to file a civil suit staying this order of the bishop and thus subvert all attempts to bring the criminals to book. Therein, the bishop can continue in his chair till his retirement, then go his way leaving the diocese monetarily, morally, spiritually bankrupt. While this will in no way shame the bishop or make him repentant of his ways, the developments of 13 and 14 December opened the eyes of a large section of the clergy and church members to the devil behind the purple cloak. The diocese and the Church of South India as a whole should hang their heads in shame for having such bishops of incorrigible moral rectitude. It is expected that the laity and the clergy would act more vigilantly in future to stem this rot in the church. In the midst of these turn of events, we are faced with a synod that is indifferent to the church drifting into moral degeneracy. In the light of grave lapses, violations of CSI constitution and active complicity in various forms of corruption, the synod should be asked to intervene with a moderator’s commissary and a commission to investigate some of these gross misappropriations and mismanagements of Bishop Kuruvilla. If he thinks that he can go scot free with the retirement, he can be rest assured that he will not have a peaceful retirement. A number of criminal cases are in last stage of becoming admitted in various courts. It is yet to be seen what his next move would be. He is capable of surprising us with behaviors that the CSI or Christian history has ever envisaged in a bishop. Fundamentally the attempt of the coterie of people behind the Bishop is to push Him to undemocratic ends -and He as the principal conspirator is quite bound to protect and support them. It is the same reason that Shri Kanakaraj at Ottapalam has averred in an affidavit before court that the decision of the Executive committee now in rein should not implement any disciplinary action till his main suit that asks to overturn the democratically conducted election in June to the Diocesan Council is heard and disposed! This is the end game! How long they want it to run is 23 March 2013! If it plays out earlier the Coterie will scoot and the Bishop -watch and see! Pray God Bring the guilty to book! It has been the habit of the diocese and different bishops or officers that based on any complaints received from a section of the congregation or clergy, full time workers or members are disciplined without giving an opportunity to accused person. Definitely the first letter is a mistake on the part of the diocese. The 2nd letter is seemed to be funny. The 3rd letter is vague. The charges should have been clearly mentioned in the letter and how the person concerned has violated the constitution or standing orders. At least from now the officers should follow exercising the principle of natural justice without fail. Otherwise, it will not stand in any court or other forums. I feel, the bishop is deliberately making a mess of everything. A person who was earlier, administering a college should have known all these basic principles. The entire scene created by the bishop before his departure to abroad is most unfortunate and he has been defiling the position of the Bishop of the diocese almost during his entire tenure. He has set bad precedents in each and every aspects. He cannot be allowed to encroach the powers of the other officers of the diocese. The Treasurer and Clergy secretary should exercise their powers. The future executive committees should discuss about this in detail. The proposed constitution amendment the powers of the bishop should be curtailed. Proper disciplinary procedures should be followed. In the case of Rev. Immanuel Dhason, if the charges are so grave he could have been suspended pending inquiry. I can't believe anyone in America would be stupid enough to let this dirtbag Kuruvilla come anywhere near their churches considering how much money and other bad stuff he has done to you good folks. Your dear friend K.P. is not on any "Ecumenical Fellowship" tour in America anymore than Colonel Quadaffi was "protecting" his people during the recent civil war in Libya. That scumbag Kuruvilla is trying to fool folks into thinking he is somebody looking out for your best interests when in reality there is ample evidence both online and in print media from reputable sources indicating your good shepherd is nothing more than a charletan and a liar. To call K.P. a common thief would be an insult to thieves everywhere because even they have some honor. K.P. is on a fishing expedition to fatten his wallet and most likely is looking up his underlings/priests in America to make sure his piggy banks are still sending money to his pet projects. Between K.P. and his priests in America it is hard to tell who is dirtier as it seems like they take after their master. Considering the evidence against K.P. 's misdeeds are overwhelming it is utterly amazing that the human vermin also known as K.P. is allowed to run things over in your place. Those folks at that one church who boycotted church services which K.P. attended had the right idea, and more folks in your diocese should do the same. Whether or not K.P. is guilty of being a criminal (which he no doubt is) the fact remains that folks are taking time out of their day to create websites like this and protest against the guy clearly shows that K.P. just cannot lead anyore. It is time for K.P. to take a permanent holiday and not come back to work especially with all of the awful things he is doing. I hope you all can get this sad excuse of a human being out of office and send his oversized body and ego to where the sun does not shine. I hope you all get this guy even if he manages to get to retirement. My guess is that he is on his North American tour to lay the groundwork to get away from you folks just in case things go south for him legally. It would not surprise me at all if the charges you all make on this website turn out to be completely true and your Bishop decides to stick around in Canada with his family over there. After all, living out life courtesy of the Canadian welfare state beats time in an Indian prison anyday. Even Satan would be jealous of Kuruvilla and his underlings worldwide because he could not be as devious and evil as your spiritual leader. What you all need to do is get Kuruvilla a one way ticket out of your diocese to some place faraway say like...Pyongyang, North Korea? He would fit in with the folks over there because like the Kim Jong Ils of the world Kuruvilla seems to live in a reality diametrically opposed to normal people in this world. Mr K P Kuru eilla he is a shame to Christians and members of N K D. He should be thrown out, it is high time laity fellowship should act immediately. He is a curse to kodukulanji people.